ABC+ an enhanced version of our industry proven Anaerobic Biochem (ABC® ) formula, promoting both anaerobic biodegradation and reductive dechlorination of halogenated solvents in groundwater. This product, Anaerobic Biochem Plus (ABC+), is a mixture of our ABC® formula and Zero Valent Iron (ZVI). Formulated and mixed on a site-by-site basis, up to fifty percent (50%) by weight of ZVI can be added. ZVI has been proven and widely accepted as an effective in situ remediation technology of chlorinated solvents such as TCA, PCE, TCE, and daughter products. The degradation process using ZVI is an abiotic reductive dechlorination process occurring on the surface of the granular iron, with the iron acting as an electron donor. The addition of ZVI to the ABC® mixture provides a number of advantages for enhanced reductive dechlorination (ERD). The ZVI will provide an immediate reduction. The ABC® will provide short-term and long-term nutrients to anaerobic growth, which also assists to create a reducing environment. ABC® contains soluble lactic acid and a phosphate buffer that provides phosphates, which are a micronutrient for bioremediation, and maintains the pH in a range that is best suited for microbial growth. In addition, the corrosion of iron metal yields ferrous iron and hydrogen, both of which are possible reducing agents. The hydrogen gas produced is also an excellent energy source for a wide variety of anaerobic bacteria. The ABC® and ZVI are mixed with potable water and emplaced in the subsurface simultaneously. The dilution factor (i.e. water content) can be adjusted to achieve optimal dispersion and distribution based on site-specific parameters such as well spacing, permeability of the formation, and contaminant concentrations. The solution can be emplaced by a variety of techniques, including injection through wells or drill rods (for permeable geologic environments such as sands and fractured rock), hydraulic fracturing (for lower permeable environments such as silt and clay), and through soil blending (for all unconsolidated shallow depth applications less than 20 ft bgs). All of these techniques are part of Redox Tech’s service offerings. The presence of ZVI allows for the rapid and complete dechlorination of target compounds. Degradation rates using ZVI are several orders of magnitude greater than under natural conditions. As a consequence, the process does not result in the formation of daughter products other than ethane, ethane, and methane. Does not require direct contact to act on target constituents. Patent protection: Redox Tech is licensed under Envirometal Technologies, Inc. (an Adventus Company) who is the current holder of patents pertaining to remediation using ZVI. 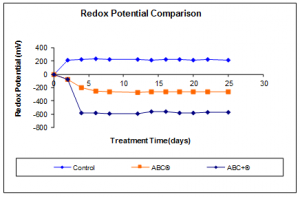 Therefore, Redox Tech is able to market, sell, and emplace our ABC+ product. There is no patent infringement risk to the client in selecting the ABC+ approach. Price advantage. The cost of the ABC+ formula is an extremely competitive approach in relation to other ERD products on the market.